Happy Monday and Happy Labor Day! We hope you are enjoying your day off. The team at ARC Crafts has been working very hard lately. We are getting ready to add a few new products and are working on more exciting changes that are coming later this month. Stay tuned! Check out this awesome office art print. 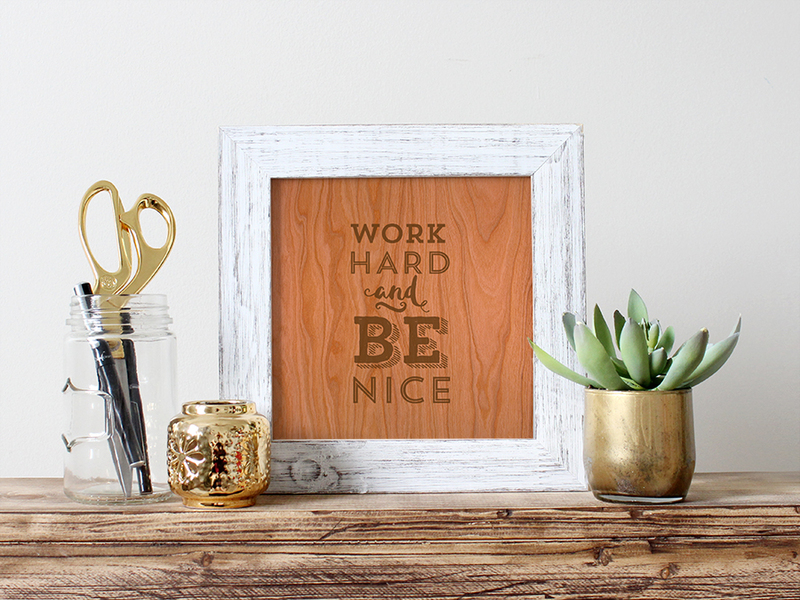 Working hard and being nice is our MANTRA! It’s great to have a visual reminder that we can see daily. We printed our file using an inkjet printer onto a sheet of 8.5″ x 11″ Cherry Wood paper. We cut the print down to an 8.5″ x 8.5″ square and then inserted into a frame with an 8″ x 8″ window. Stylish and inspiring. We appreciate you and your readership. Your efforts have paid off … you’ve worked hard and you deserve a little reward. We created this downloadable printable just for you, FREE! Simply download this file, print and frame. You are welcome! Enjoy the holiday from your friends at Et Cetera Papers. This entry was posted in Crafts & Kits, DIY Projects, New Seasonal & Special Occasions and tagged cherry, downloadable, signs.